Tom – As we crossed into Asia over the vast suspension bridge that spans the Bosphorous the heavens opened. Our first impressions of Asia was not at all the dusty dry Turkey that we have seen in summer. Here in April, it is lush, green and verdant and again more like England in the spring. Out of all the countries we are planning to travel through, Turkey has been the one we were most concerned about due to the current situation in Syria. So far, Turkey has actually been a wonderful surprise. Though Tom and I have sailed up the Mediterranean coast of Turkey before, the interior is new to us. Everywhere we go, people are utterly delightful and delighted to see us. People are so keen to communicate with us and it is frustrating that we cannot get much further than mad grinning and hand-signals. English is a rare thing along the Black Sea coast and our Turkish is non-existent, but in almost every encounter with the locals we are asked to visit their family and given telephone numbers of relatives. Other times cars poop their horns and people wave as we pass. Its mafia style man-hugs for me, cheek squeezing for the kids and hand-shakes for Justine. We spent the next five or so hours climbing to about 2000m into the Anatolian highlands and as we climbed the rain got heavier and we moved from England to what looked more like the Scottish boarders. Every hour or so we passed a recently overturned car or lorry. The road was perfect and empty so I’m not sure why there were all these accidents but it certainly helped me focus as I peered through the small arch swept by our tiny Lucas wiper blades. The wiper on the passenger side is very slow, so Justine has to manoeuvre her wiper by hand! As we pulled into fill up, a comedy show repeats itself at ever filling station as the eager attendant darts round and round the car looking for the filler cap. All passengers jump out of the car for saftey’s sake as in Series One Land Rovers the petrol tank filler is alarmingly under the front seats. As evening closed in we rolled down the long hill to Safranbolu passing a vast steel mill. The rain had finally begun to subside but we noticed a haze from the loads on the trucks we were now following. The steel on their trailers was still glowing hot and the last spits of rain turned to steam on contact. Safranbolu is an old Ottoman town in the hills and has a renowned ancient bathhouse. It’s certainly very old and from the outside on a cold rainy night did not look like the sort of place I fancied taking my clothes off in. However we needed a wash so a hamam and a massage was rather tempting after a long drive. The girls delightedly went in one door and Hector and I reluctantly in another. We had been hoping for something Balinese with flowers and floaty music but it was not long before we were face down on a marble slab being sandpapered (exfoliated) by a very fat Turk called Abdulla. Abdulla then soaped us up with an impressive soapy pillowcase trick and pummelled us before throwing buckets of water at us to rinse us down. Actually, it was a surprisingly good massage but I feel slightly ill when I think of the moment that my face was sandwiched between Abdulla’s vast belly and the marble slab as he massaged my back. The girls had a similar pummelling but in their case had a vast breast, face, marble slab, sandwich. We all joked that it was a long way from a Balinese massage. Justine – Our questhouse was in an old Ottoman house up steep narrow cobbled streets and we slept like logs only awaking to an incredible dawn chorus. The amazing spread of breakfast was too far from the Fruit and Fibre that Tom avidly sticks to at home. Olives, salty cheese and tapenade was welcomed by Petra and I, but Hector and Tom stuck to the rose-petal jam and bread, which looked comfortingly familiar. After buying some of Safranbolu’s fabled walnut halva we headed out of town with some steep hill descents, which called for us to douse the brakes with water a couple of times. Even this does not perturb Kabylie who is functioning so well that it is incredible to think that a few weeks ago, she had only ever been 3km to the beach and back! In the last two weeks she has driven over 3200km without a problem except for ‘The Squeak.’ A really irritating squeak has developed in Petra’s door hinge, which no amount of tinkering seems to fix. Jamming a fork rather precariously in it can only quieten it. No amount of adjustment seems to cure it for long and the conclusion is that it is probably due to our large roof load. Most of the landscape we have driven through is green and mountainous. Small villages huddled around mosques perched on improbably steep hillsides all the way up to the height of the thawing snow. We have managed to wild camp some nights, finding dirt roads through small villages where the bird song at dawn and the stars at night are incredible. One gorgeous spot was in a field at the end of an old lady’s garden. Cape Jason, where apparently Jason and the Argonauts rested before searching for the Golden Fleece was too exposed and it was getting late. I spotted an elderly lady in traditional clothes stoking a fire. With a stroke of luck the word for ‘camp’ in Turkish is the same as English so with my one word and much gesturing, she agreed to let us camp in the field at the end of her garden overlooking the bay. We managed to communicate via a phone call to her granddaughter in Izmir who duly translated questions too and fro. We have finally arrived in Trabzon, one of the last significant cities in Turkey on the road to Iran. Tonight my parents arrive and tomorrow all 6 of us (and their vast bags) stuff ourselves into Kabylie and head over the mountains to the Iranian boarder. We are not sure how much Internet access we will have in Iran so this may be the last post for a while. We are all very excited about Sally and Mike Oliver, my parents joining the retro-road trip. It is probably due to both sets of parents that we are on this trip at all as it was them that infused us with the adventuring spirit throughout our childhoods. Interestingly both my parents and Tom’s dad drove the very route we have taken so far when they were in their 20’s. In 1960 Mike, my father, drove to Iran with the British Museum backed Oxford University expedition in search of one of the lost castles of the Assassins in the Alamut Valley, which incidentally they did actually find. In 1963 Andrew, Tom’s father drove a Bedford van with three friends from the UK to Syria. Then in 1966 Mike and Sally (my mother) set off with four others in a split screen VW for three months to drive to South Africa. One years later they arrived in Cape Town having taken in most of the Middle East, Afghanistan and India on route. They fondly remember a newspaper article written about them headlining ‘Beatniks Hit Beirut.’ Thus our trip seems rather humble compared to theirs! Tom was very keen to find someone to service the car today. 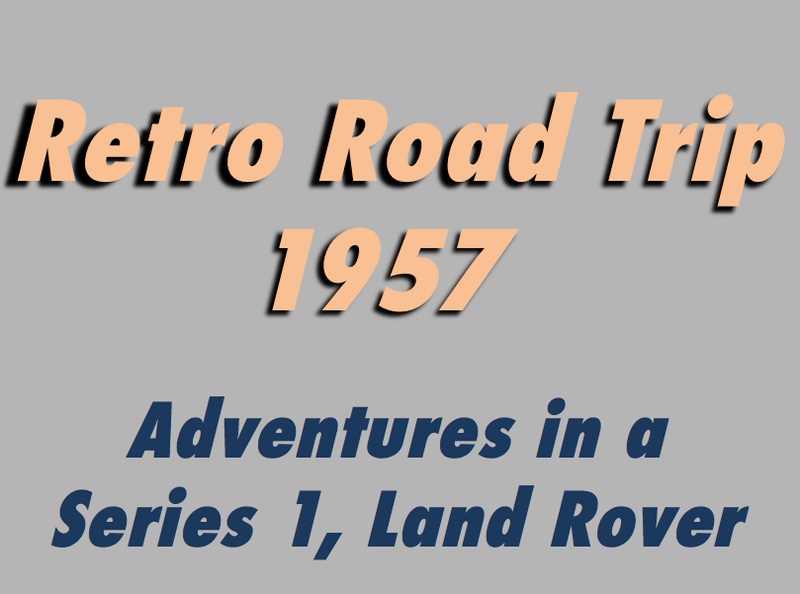 We managed to find a Land Rover garage and whether it was the car or Tom’s super-man change into his blue boiler-suit, we were royally welcomed. The only English that was uttered was the Land Rover team pointing at Tom exclaiming ‘Jim Carey! That must have been a compliment as we were not only welcomed like long lost friends but given a vast lunch, an oil change and the replacement of a front wheel bearing oil seal and they would not accept payment! They were as excited by Kabylie as Hector with a new Lego set at Christmas. We left after Tom was kissed and man-hugged like a mafia godfather. Delightful, kind and generous people. This once gain confirmed our good impression of Turkey. Fabulous roads, everything is clean and impeccably managed and even the dogs, yes even they are well managed and remain silent at night! For the next leg of our journey from Trabzon to the Iranian border Petra and I are concerned that we look too like a military vehicle though Tom and Hector are insistent you would have to be pretty daft to make that mistake. After some pressure Tom has reluctantly agreed to a “Love and Peace” camouflage idea. He has kept putting it off but the time has come. Between here and the Iranian border we will be passing Mount Ararat, which many Christians believe was the final resting place of Noah’s ark. It was felt that a dove was maybe too symbolic but who could have a problem with a parrot.!! South American, another continent! Over the next few weeks we will see if the parrot is the new dove…………. Finally, a few people have asked how our roof tent works…..I hope this youtube explains it better…..
Have you got a drone? How are you doing those distant video shots while on the move? Wish we had a drone but not sure if they would like that in Iran! Its a painters pole with a GoPro! Amazing stuff. Love the stop motion video. I’m giggling on the train home at all the man-hugs and kisses that Tom is getting. Don’t get too excited Mr R! Hope that the roads ahead are as smooth. I’m sure you will find continued interest from all you meet. Take care how you go and we can’t wait to read the next installment. Very cool, I like the parrot, very subtle. I thought as I was reading this that you were actually going to write ‘Love and Peace’ on the side of the landy and I would have been very surprised if tom and hector were cool with that! No! not cool with that! Actually the parrots lasted about half an hour as they damaged my paintwork! Wow, you guys are incredible! Loving the blog and videos!